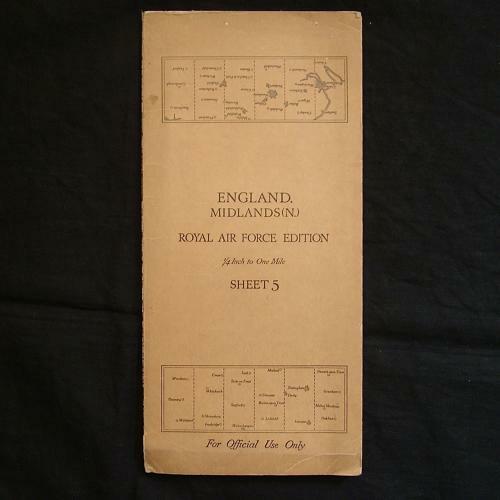 England, Midlands (North), Sheet 5, R.A.F. Edition dated 1938. 1/4" to one mile. Linen backed paper with card covers. Approximately 75 x 52cm. Shows wartime air bases operational at the time including Ternhill, Shawbury, Cotesmore, Hucknall (of Franz von Werra 'The One That Got Away' fame), Hooton Park, Hemswell & Scampton (of 617 Squadron Dam Buster fame) etc. Folded and creased. Light soiling and some wear on the folds. Very good used condition. Stock code P20649.